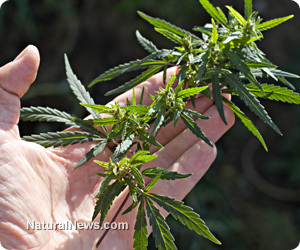 (NaturalNews) As the war on cannabis continues in most U.S. states, one brave North Carolinian who openly grows his own medical cannabis plants -- and broadcasts this fact publicly -- has intentionally taken the fall in a bold move that could be the spark that eventually ends cannabis prohibition in the so-called "Bible Belt," an area of the country that has seen the least proactive change with regard to cannabis reform. Medical cannabis activist Robert Dorr, as reported by the Indie Register, was recently arrested for growing his own natural medicine, something he has been doing openly for quite some time in defiance of state law. Unlike the many other growers in his area who have had run-ins with the law for their "underground" cannabis activities, Dorr has been intentionally open about the fact that he grows cannabis. Rather than try to hide the fact that he grows cannabis, Dorr believes that the only way to instigate real change is to be open about it in order to essentially shatter the status quo. Prior to his arrest, Dorr actually called up the local district attorney and sheriff's office to notify them of his growing activities, even leaving his address so they would know where to find him. And find him they did. According to the Indie Register, Dorr was arrested just a few days later by local sheriff's deputies and shipped off to the local Union County prison near Charlotte, even though his "crime" was victimless. But Dorr's arrest has not been in vain, as his story is now gaining national attention, illustrating the foolishness of the ongoing anti-cannabis crusade in many parts of the country. Prior to his arrest, Dorr created a Change.org petition directed at North Carolina Governor Pat McCrory, who earlier this year failed to bring a floor debate on the Enact Medical Cannabis Act, also known as N.C. 84. The bill, which was rejected by North Carolina's House Rules Committee back in February, would have legalized possession and use of medical marijuana in the state. "Living in a shadow or being looked upon as something less than a law abiding citizen is no longer acceptable for those who are just that, but use marijuana to treat a disability," states Dorr in his petition. "If you are an honorable person who uses marijuana or cannabis medically, speak out about this issue." As far as his arrest, Dorr's brother told reporters that the arresting officers were actually quite supportive of Dorr's position. Rather than treat him thuggishly as if he was some sort of criminal, the officers were kind and empathetic, admitting that many legal medicines like pharmaceutical drugs are far more dangerous than cannabis. "They were very compassionate towards his situation which surprised me," stated Dorr's brother to reporters about the arrest. "One said that he actually understands why [Dorr uses cannabis] and made mention of legal drugs being worse than the illness and that he believed [cannabis] will be legal in the next five years or so." The Union County jail website states that Dorr is being charged with manufacturing a schedule VI controlled substance, and his ransom is set at $25,000. In the meantime, Dorr and his supportive family members and friends hope that his story will ignite outrage that eventually leads to positive change for medical cannabis in North Carolina and hopefully surrounding states.